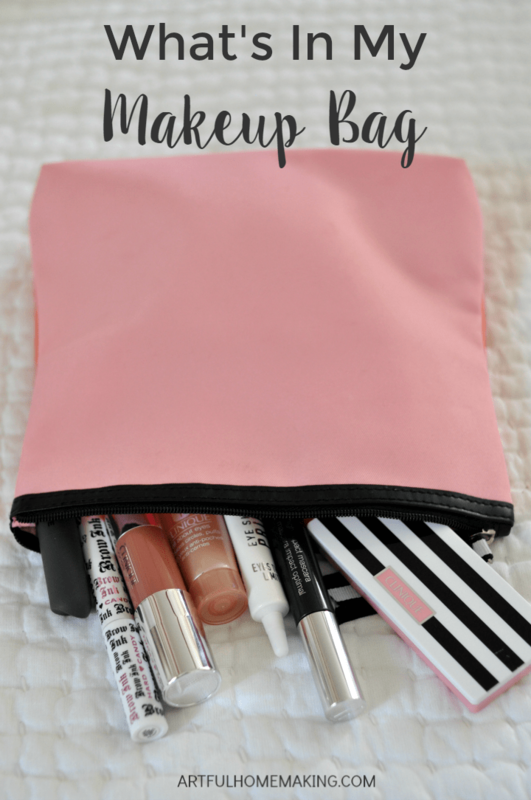 Since we’ve been talking about makeup in this week’s Mom Makeover challenge, I thought it would be fun to give you a peek inside my makeup bag. I always love talking makeup with friends! I have a confession to make. Are you ready for this? Okay, here goes. I never leave the house without at least minimal makeup. Before you judge, let me tell you a little bit of my story. See, I’ve dealt with acne my whole life. Even in my 40’s, I’m still dealing with acne. Usually most people can’t tell, because as long as I use Benzoyl Peroxide twice a day, I don’t have breakouts. And, believe me, I’ve tried every natural acne cure known to man: salicylic acid, coconut oil, essential oils, bentonite clay, green clay, manuka honey, gluten free diets, dairy-free diets, etc. You name it, I’ve probably tried it. And none of it works. After I’ve totally messed my skin up with all that natural stuff, I always go back to my Benzoyl Peroxide, and after a few weeks, my skin clears back up. So, because I have less-than-perfect skin, I wear makeup whenever I go out. And before you imagine a heavily-made-up woman, sometimes people can’t even tell that I have any on (in fact, one of my daughter’s friends said to her, “Your mom doesn’t wear makeup, does she?” My daughter said it’s because I don’t wear enough 🙂 ). Mostly I just try to even out my skin tone, cover blemishes and scars, and try to look a little brighter. This past Christmas, my mom surprised me with this adorable pink and coral makeup bag from Clinique that was filled with new makeup! Inside the bag was eye shadow, blush, lip gloss, eye liner, two mascaras, and eye cream. It was such a fun gift! I’ve been wearing Clinique makeup since I was about 13, when my dermatologist recommended it to me. During my teen years, I also used their skincare line, but now I just use my homemade soap, rose petal witch hazel toner, and Neutrogena On-The-Spot Acne Treatment. Whenever I’m staying home for the day, I usually give my skin a break from foundation and just wear lip liner, lipstick, and lip gloss. Sometimes I add mascara and brow ink (because for some reason my eyebrows have faded with age!). If I think there’s a possibility I might be seeing someone other than family, I’ll go ahead and put on concealer, foundation, and some eye makeup. Cowgirl Dirt Yeehaw Lipstick in Seattle Slew (not pictured, but I’ve been using this every day for years now—it’s a favorite!) I wear this over the Bite Beauty lipstick above, kind of as a lip gloss. As I mentioned above, I never leave the house without at least minimal makeup on. But whenever I’m going somewhere, I’ll put forth a bit more effort, especially with my eye makeup. Mostly it’s the same products, but I do add in a few things. Why So Few Natural Choices? Honestly, I would love to switch all my makeup over to more natural things. However, there are a few things that have prevented me from doing this. Number one, I’ve got the acne issue. I’ve never been able to find a natural foundation or moisturizer that doesn’t cause me to break out. So, I feel like I have no choice but to continue on with Neutrogena and Clinique. Number two, performance. 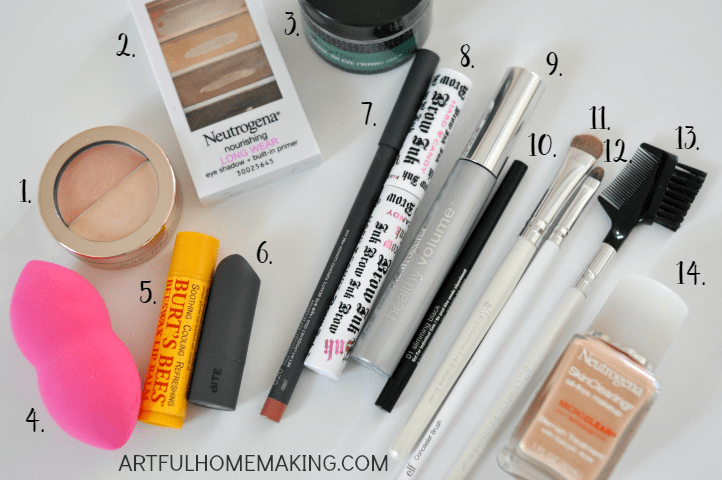 I’ve tried many natural makeup products in the past, but most of them were a disappointment. The company that I’ve stayed with the longest is Cowgirl Dirt. I especially love their eye firming cream, the lipstick, and the lip gloss. My girls also love their body glitter. If you know of a natural makeup company with products that perform like professional makeup, I’d love to hear about it! And the final thing that has prevented me from totally switching over to all-natural makeup is cost. Most of the makeup I’ve purchased is fairly inexpensive (the Clinique makeup listed above was a gift from my mom). Many of the natural makeup companies are more expensive and have high shipping fees. I’d love to hear what your favorite makeup is. Let me know in the comments! This post contains affiliate links. Sharing here. Wow nice! To make it organize use roadeavour’s travel toiletry kit! I am so glad I found your blog. I love it! I always love seeing what’s inside other people’s bags because nine times out of ten, i’m going to buy something they have and love! My Mom got me using Clinique when I was a teenager, too. They’re products never fail my super sensitive skin. I’ve been wanting to try Hard Candy products and I’d never heard of Cowgirl dirt but now I really want to try that line, too! I am terrible in doing proper make up. My wedding day was the first and last day when I had applied maximum layers of make up on my face. I too have acne break out problems. The maximum I can do with make up is pressing my face with some compact powder and putting a dark lipstick. I love to wear eyeliner though. But since I need to wear glasses all the time, so the effort of putting eyeliners goes in vain. To be honest , i get awestruck when I see women around me carrying make up in an elegant manner and look so beautiful. I know what you’re talking about regarding the need to wear glasses! I also wear glasses much of the time, but I go ahead and put on eye makeup anyway if I’m going out. Thanks so much for stopping by! I always think it’s fun – and a great way to discover new products – taking a look in someone’s makeup bag. I really enjoyed this peek into yours. And I never leave the house without at least minimal makeup either 🙂 Thank you so much for sharing, and for being a part of Hearth and Soul. Have you looked at 100% pure? They are a bit expensive but I’ve heard great things about them. So far I love Cowgirl Dirt, it’s all I use. And I was excited to hear that Young Living just came out with a make up line. Yes, I’ve looked at their website many times, but I still haven’t tried them yet (because of the expense thing 🙂 ). I hadn’t heard that about Young Living—how neat! 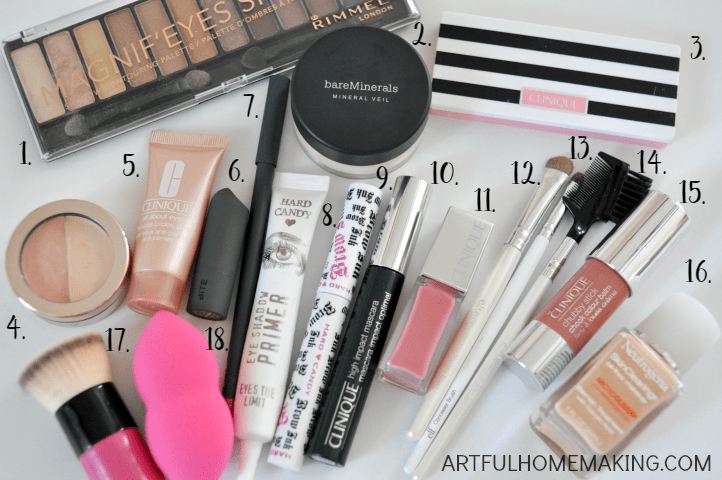 It was fun to read what’s in your makeup bag! My daughter deals with acne so I’m going to share what works for you! I hope it’s helpful to your daughter, Julie! I’m also one that most people don’t know I wear makeup. And honestly, I’m not sure my minimal effort makes a lot of difference but it makes me feel better. 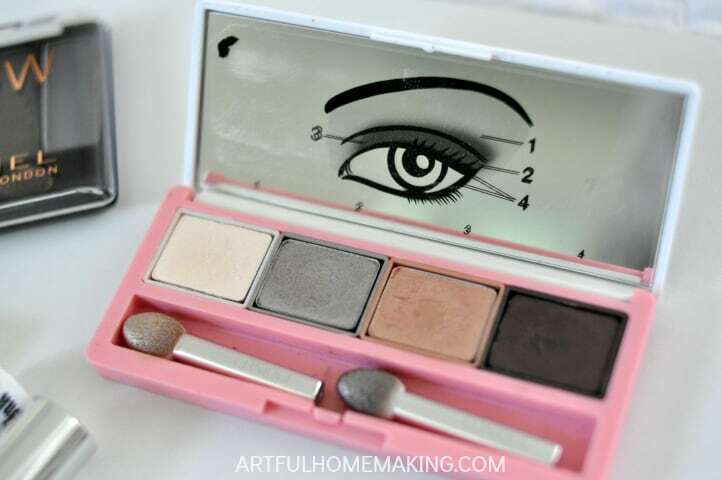 I use the Almay line for my mascara, blush, and powder which I really like. 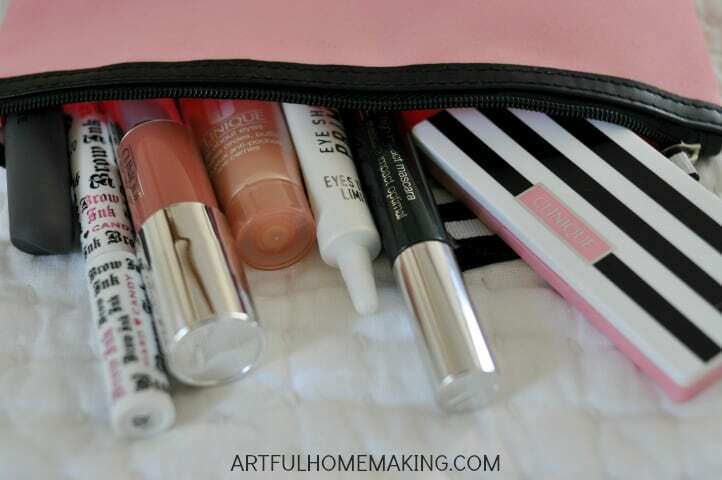 For lips I use the Naked Bee brand, they have a Rose tinted lip balm that is natural looking. The only foundation I like is the Maybelline Fit Me, it gives really good coverage to even out skin tone. I like a natural, but polished look! I’ve never heard of the Naked Bee brand, thanks for sharing! I’ll have to check that out!